Hello everyone! I have a Christmas card to share with you today for the Global Design Project Challenge. This week the team is CASE-ing the talented designer Brian King. The card in the challenge sketch has a lot of delicious layers. A lot of layers on a card means a lot of love! 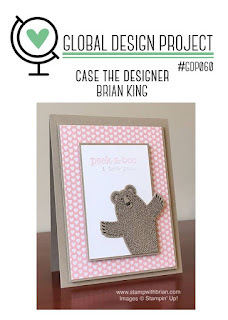 You are invited to take the challenge and play along with us this week CASE-ing Brian King. Click over to the GDP to see what the design team has created and see what followers from around the world are sharing for #GDP060.